Some years ago, I bought a pair of slippers known as "scuffs" or "slides". You slide your feet into them and they have a covered front and a bottom and that's it. Easy on and easy off. They have a nice warm upper and a sturdy sole. Those slippers have served me in very good stead, but are getting a little long in the tooth. So, I've been looking, for awhile, for a new pair. I'm picky. I found what I thought was the perfect pair, but they had a cardboard sole which wouldn't keep my feet warm if you heated it. I suppose I should not have expected much for their $5 price tag. I put slippers on my birthday/Christmas list for a couple of years until I realized that, should someone actually buy me slippers, their idea of what I would like versus my idea of what I actually wanted were two vastly different things. It was then that I decided I should just search myself for what I wanted and not leave it up to chance. The need to make a birthday/Christmas list meant I had to look for things. In searching a web site called fansedge.com for Iowa Hawkeyes stuff, I stumbled across these. Using Retailmenot.com (and you are using this site or something like it when you order online, right? Right? ), I got them for $11. That is worth it for slippers. They were a bit uncomfortable on the first couple of wearings, until they conformed to my feet. Technically, there is no left or right to these, but, with repeated wear, the top molds to your feet so you wind up with a left and right pair. I know when I put them on the wrong feet. Hello gorgeous. These have a hard plastic, non-skid sole that is covered by the black fleece. the top is light weight black fleece and the tiger hawk is embroidered directly onto the top. It's not an applique. Now that I have them broken in, they are warm, so very, very warm. Add fuzzy socks, like I did in the photo and my feet are wonderfully comfortable. I keep the other scuffs around because their harder sole means I can wear them outside. The new ones are washable but I don't want to get them dirty or wet in going to the recycling bin or the mailbox. 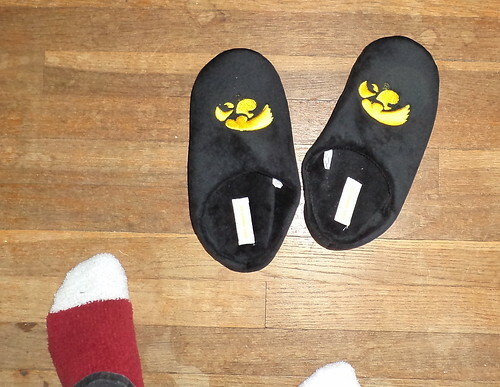 Unfortunately, they didn't bring the Hawkeyes good luck as we won only 1 of the last 4 games since I got the scuffs. I would listen to non-televised games on my computer and watched the last 2 on TV. 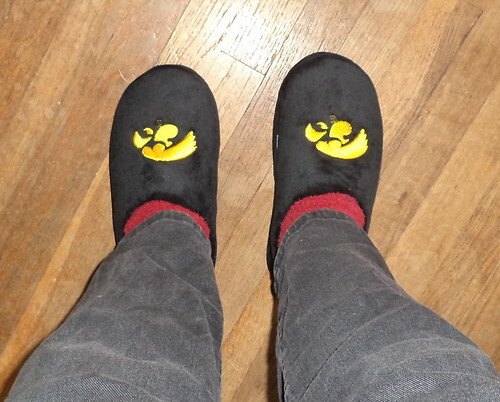 They may have been bad games, but I had warm feet.